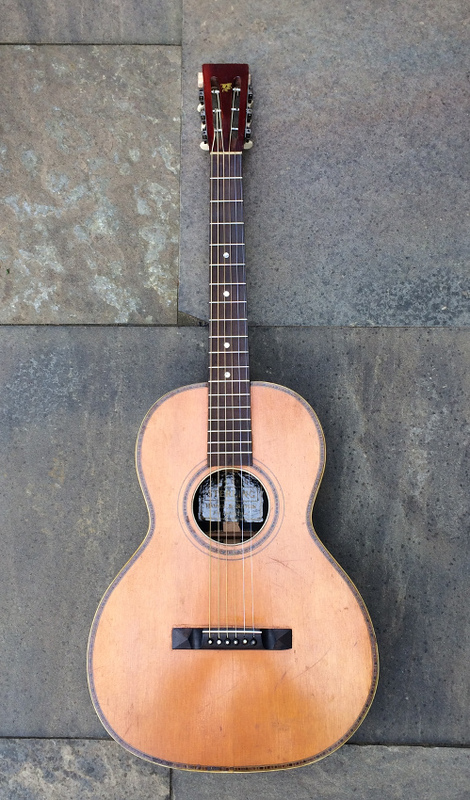 Oscar Schmidt 'Sterling' Grand Concert Guitar ca 1915 | SOLD | In the early parts of the twentieth century the Oscar Schmidt company, and other guitar factories, built guitars for other distributors. Victoria, Miami, U.A.C, First Hawaiian Conservatory of Music are but a few. 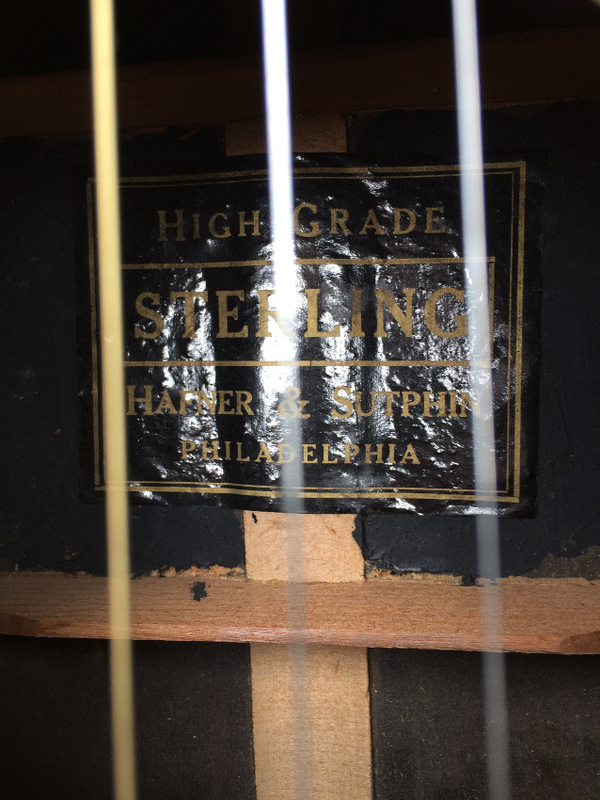 The Sterling label is one we've not seen before, but based on the construction of the guitar, it's easily attributed to the OS factory, and, along with the style of the label, we'd date this example to around 1915. It's a very nicely built guitar with some quality features. It's grand concert size, measuring 14 3/4" across at the lower bout, with a long scale, about 26 1/2". The body is birch, faux-painted to resemble rosewood, and ladder braced. 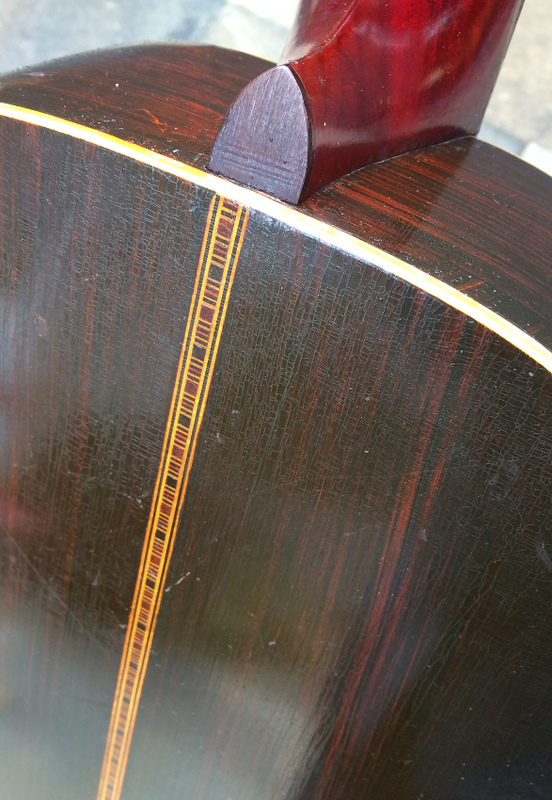 The top is spruce with colorful wood marquetry adorning the edge and sound hole. An attractive marquetry strip adorns the back as well. 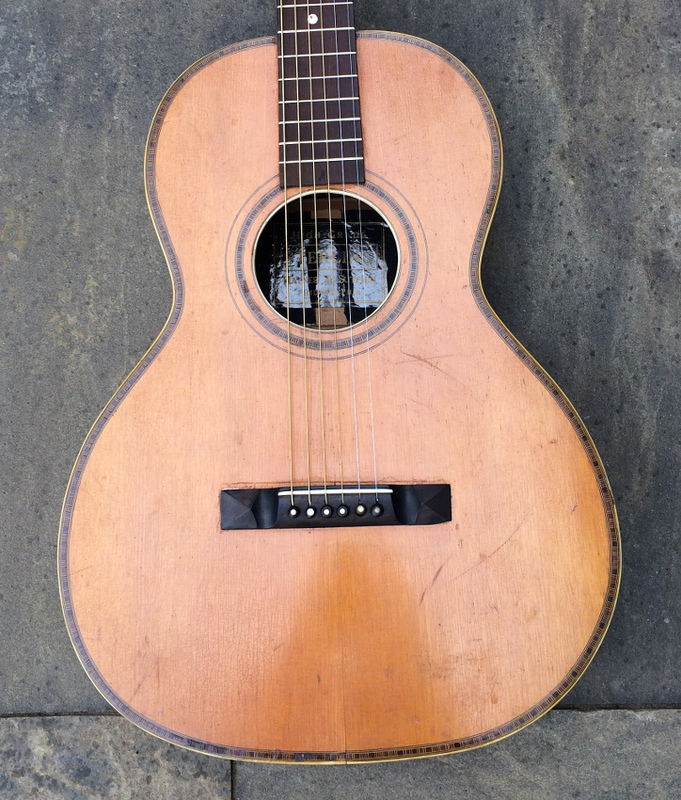 Overall, the guitar is in excellent, original condition, with only minimal evidence of wear. 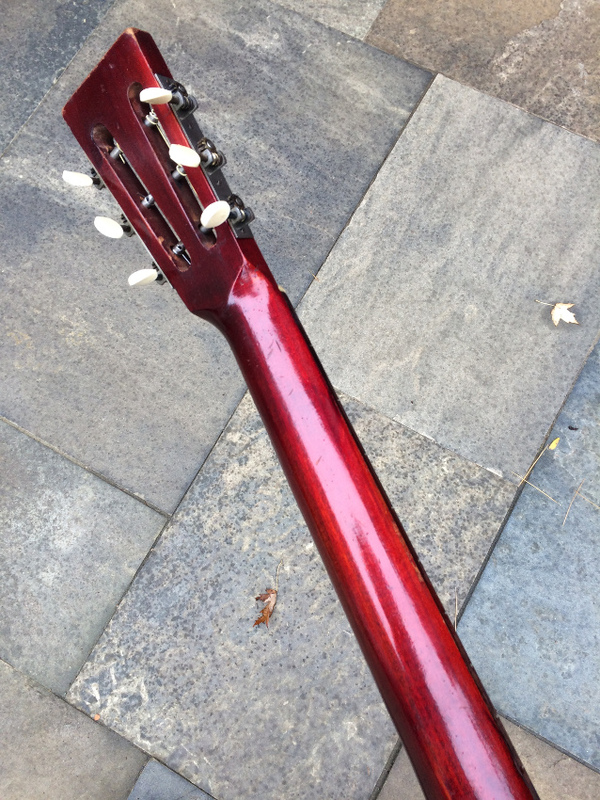 Recent repairs include a neck set, and bridge reglue. Before the bridge was reglued, a hairline between the pinholes was glued and filled, thus preserving the original pyramid bridge. There is a tight crack on one side in the area of the waist that is very tight. Frets were leveled and dressed. And for some odd reason the inside of the guitar is painted black, and when examined closely, it's pretty certain this was done upon assembly at the factory .. we'd not seen this before. 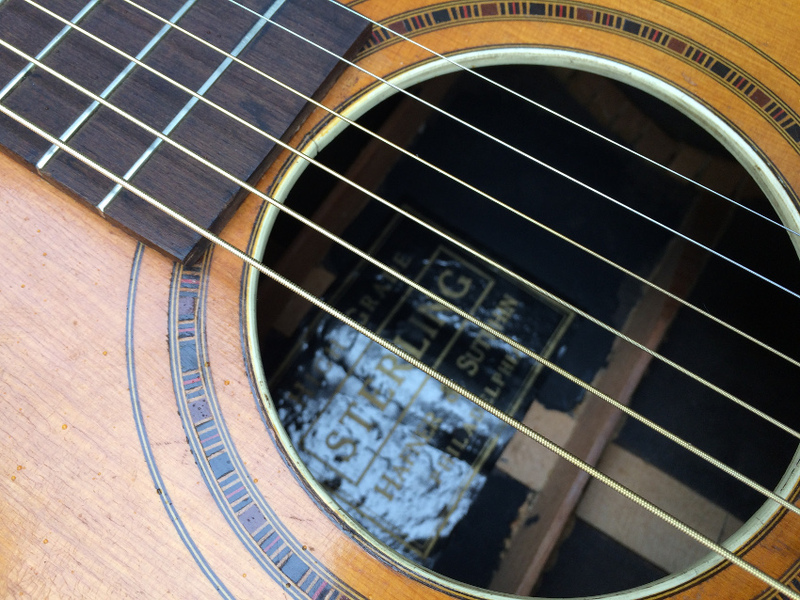 The guitar plays beautifully, with a full, rich sound, quite resonant with good sustain. One of the nicest grand concert 'Stellas' we've offered. Comes with an older soft case.